And why not? He’s come into a position he has very little top level experience in at a time we really need someone to give us a new option and has excelled in so many different ways. Chamberlain came through the much heralded Southampton youth academy playing in a more central role to what we’ve seen him play so far at Arsenal. His performance against Manchester United in the 2011 FA Cup was one of the first showings of his potential. Drifting in and out of a team of top class players with speed and guile. A lot of teams took real notice of him that night, namely Arsène Wenger who spent £12m to take him to the Emirates 6 months afterwards. In Chamberlain’s first season the promise was undeniable – playing the majority of it from the left wing he showcased all the attributes of a natural winger but showed he could play clever passes in tight spaces too, his reverse ball to set up Van Persie on his first start the best example of that. Since then spells of exciting quality have been separated with injuries and what can only be described as positional disillusion. Is he a left wing inside forward, a direct touchline winger on the right flank or ready to write his own story in the middle? The last few weeks have given us all reason to hope for the latter, a position Wenger has always said he see’s Ox’s future in. One thing I’ve always thought about Chamberlain is it’s almost like you have to force him to think, at times he really does seem like he can suffer from tunnel vision. If you play him on the right he’ll run the outside of the full back all day long but will frequently refrain from playing difficult balls that he see’s in favour of keeping it overly simple; but if you play him on the left he’s forced to look to pass more because the by-line is no longer an easy option. That was further amplified with his recent showings in centre midfield; against Hull he was playing beautiful first time passes almost reminiscent of Cesc Fabregas. We all remember getting rocked 4-0 against AC Milan in 2012 and going into the second leg with an impossible task. Injuries in the centre of midfield lead to a 4-3-3 with Rosicky, Song and Chamberlain. Through necessity this was Ox’s debut in a central position in a massive Champion’s League tie and to say he shone would be doing him a disservice, he was imperious. His dipping corner set up the first goal from a Koscielny header and an irresistible burst from central midfield into the right side of the Milan box forced a penalty that Van Persie then converted. The kind of belief and composure he showed in that game was unbelievable and that’s what we’ll be looking at him to build to now. One thing that may have come somewhat unexpectedly is Chamberlain’s discipline in central midfield. He’s shown a real focus to defend and that’s highlighted by the fact he made the most ball retentions versus Hull (9). You could attribute this down to a young player learning a new position focusing on the basics but something has still clicked in him. He’s being forced to think and he’s being forced to react naturally and he looks comfortable. For the moment, at least, he has clarity. 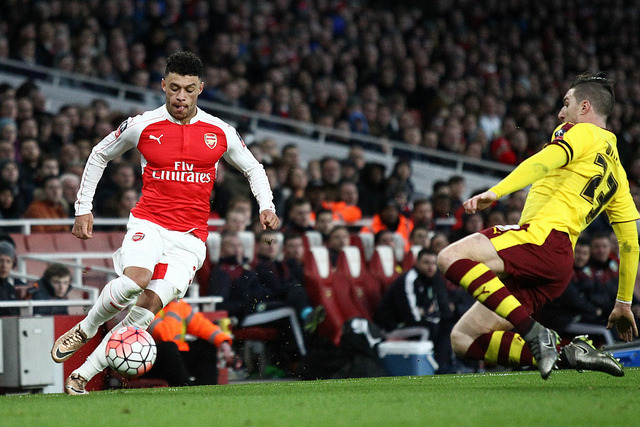 Ox has recently impressed centrally. Credit joshjdss under license. Last season for Leicester there was an abundance of praise for N’Golo Kanté’s defensive master classes – and rightly so, however another major piece of Leicester’s success came from his ability to carry the ball. Kanté could win or receive the ball in deep midfield and drive into space, carrying Leicester through transitions from being attacked to being the attackers. Chamberlain offers this in abundance and the more he plays there the more he’ll learn to work those spaces. The one thing I’ll say against him is I don’t think he’s a player who thrives receiving the ball from the centre backs. He’s actually coped with that side of the game fairly well in recent weeks but I put him more down as a player who receives the pass from defensive midfield instead of being the one to make that pass and in that sense Coquelin isn’t the ideal partner for him in my opinion. Although next to a Cazorla or Xhaka, players who can dominate that area of the pitch and take players out of the game with the first pass -allowing Ox more space to run and play into could see him go to the next gear. As long as he stays disciplined and grounded in his defensive duties he’s an amazing mystery to watch play out. As impressive as Chamberlain has been in a central berth it’s not something I’d say has been clinched yet. I can still see him being moved back to the wing when more experienced central midfielders are back available. That’s why Wednesday versus Munich could prove huge in his future there – because realistically he’ll only become a natural central midfielder with consistent playing time there. A performance against Bayern in the mould of the performance against AC Milan will surely go a long way in earning any lacking trust Wenger has in him regarding that position. The future for him now will be to really create his own identity in that role. He needs to be brave and have the initiative to take control of that area. Too many times this season we’ve suffered from players who pass the buck to more creative players. We should build the team around a spine of players who want to influence the game. We have that in Koscielny/Mustafi/Xhaka/Cazorla/Özil/Alexis, the problem has usually been getting enough of those players in the team. The injuries of Cazorla and suspensions of Xhaka certainly haven’t aided this, which is another reason why Ox’s evolution has come at a very necessary time. This entry was posted in NewsNow, The Bergy Blog and tagged Aaron Ramsey, AFC, Alex Oxlade-Chamberlain, Arsenal, Arsene Wenger, Champions League, Coquelin, Elneny, Flamini, Francis Coquelin, Gunners, Injuries, Jack Wilshere, Mesut Özil, Santi Cazorla, Tactics, Wenger, Xhaka. Bookmark the permalink.